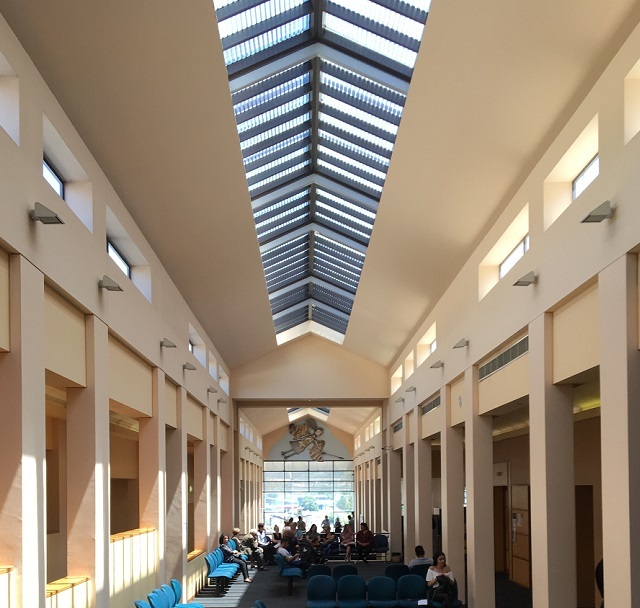 Inside the Campbelltown Court complex in Railway Street. Campbelltown Court is at full capacity, while Camden Court sits for just two days a month. Picton Court, which hears domestic violence and AVO cases, lacks the security required for such disputes. For family law matters, local residents have to travel either to Parramatta or Sydney. These are just some of the reasons the NSW Law Society has launched a vigorous campaign to convince the state and federal governments to finance to the construction of a South West Sydney justice precinct. The Law Society also relies on forecasts that the local population will exceed one million people by 2036 – a city the size of Adelaide. “There’s never been a more pressing need to build a multi purpose justice precinct in Sydney’s South West,’’ says Elizabeth Espinosa, president of the Law Society. “Court facilities in Sydney’s South West are out-dated, under resourced and unsafe and failing to meet community needs. “The courts in Campbelltown, Camden and Picton are either at capacity or not equipped to manage the delays and backlogs in criminal and civil cases. Today, Campbelltown City Council issued a statement that it supports the Law Society’s call for a Justice Precinct in South West Sydney and made a pitch for it to be located in Campbelltown. “An expansion of Campbelltown’s existing court precinct presents the opportunity to address the current absence of Federal (including Family) Courts in Western Sydney,” says Mayor George Brticevic. “The attraction of a Court of Federal jurisdiction in this precinct would ease the burden for families attempting to resolve disputes, currently having to travel many hours to access justice services,” Cr Brticevic said. “In addition to the community benefit from accessing these services, a substantial justice precinct in Campbelltown City would deliver a major economic anchor in the Campbelltown CBD, creating higher order employment and improved opportunities for knowledge sharing,” he said. “Already in Sydney’s South West, our community experiences extended periods of time to resolve criminal matters, far longer than our inner city counterparts,” says council general manager, Lindy Deitz. “This not only affects victims and their families in prolonging their distress, but also defendants, often in remand awaiting their day in court. The flow on effect of this delay causes increases in people in custody for extended periods prior to trial, at significant cost to the community,” Ms Deitz said. “Campbelltown’s existing justice precinct, currently servicing Local, Children’s and District Court needs, requires investment to increase in size to accommodate the growing needs of the community it serves,” she said. The existing Campbelltown precinct is readily accessed through existing transport networks including the M31 freeway, public transport and bus networks already frequenting this court precinct. “The close proximity of the police station presents a further opportunity to explore co-location of emergency services, creating efficiencies in processing and transport,” Ms Deitz said. 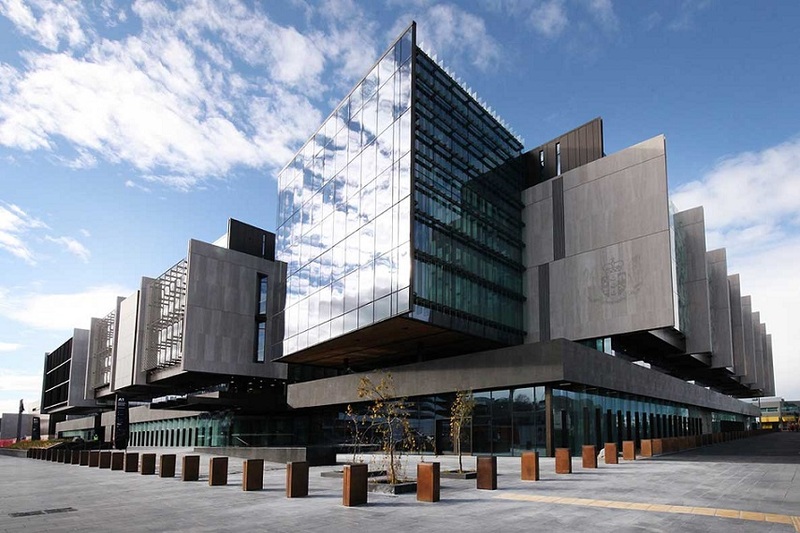 The Law Society is suggesting the newly built justice precinct building in Christchurch, New Zealand (pictured above), as a model for one in South West Sydney. “By the time Sydney’s second international airport Nancy-Bird Walton is operational in 2026 the population in the south west will have grown from 700,00 to nearly 900,000. By 2036 the population will have almost doubled to 1.1 million. ‘We need the State and Federal Government to urgently commit the funds needed to build a new multi-purpose justice precinct in south western Sydney.